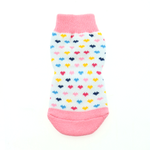 Protect your floors and your dog's paws with this loving and colorful Non-Skid Dog Socks in Pink and White Hearts! These Non-Skid Dog Socks have a fun and colorful design with an adorable rubberized Doggie Design logo on the paw for grip. 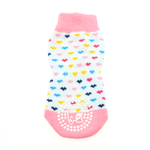 These pink and white socks are cute with their multi-colored hearts, but they are also practical! These socks for dogs grip on slippery surfaces and protect your hardwood floors from nail scratches. They are also ideal for dogs with foot injuries, allergies, and sensitive feet. These non-slip dog socks can also assist elderly dogs to get up and down on slick surfaces such as tile, hardwood floors, and finished concrete. Keep your pet from injuring tender joints with these fashionable anti-slip dog socks. Made with 100% cotton with some elastic in the cuffs. They are machine washable, but line dry to avoid shrinkage. Posted On 01/07/19 by Susan P from Marlborough, MA Yes, Susan P recommends this product! Got these for my 13 year old German Shepherd to help her walk on floors not covered with small rugs. They are lightweight and she loved them. They don't stay on for very long but I had been using double sided non skid hospital socks with the self gripping tape(used in vet office) to keep them on. I did the same for these socks and it works! I'm using the pretty socks during the day and use the hospital socks at night. It would be great if the sock makers put non skid on both sides so when the socks move around their feet always have the non skid. Shiloh has some arthritis and pulled a muscle(now healing) in her back legs and these help her play with her 18 month old doggie niece(yes they really are related!) Dakota! Will buy again but will get XLarge to give her feet a little more room. Posted On 07/10/17 by Jennifer L from Senoia, GA Yes, Jennifer L recommends this product! these are easy to put on and they stay on! They keep my puppy from sliding! My baby Chi's feet are tiny! Posted On 07/09/17 by Cassy M from Pecos, TX Yes, Cassy M recommends this product! I ordered these in extra small since that's what size she wears, my baby Chi's feet are tiny! and they were to big. The band doesn't even stretch on her tiny little legs. Poor baby her feet still get cold tho. For the price tho I didn't want to hassle with a return. Maybe I can find some smaller ones soon. Posted On 06/25/17 by Jennifer L from Senoia, GA Yes, Jennifer L recommends this product! The xs is perfect for my 5.5 pound, 4 month frenchie. Posted On 04/05/17 by Deborah C M from Homosassa, FL Yes, Deborah C M recommends this product! I bought doggy socks for my big, black, beautiful lab Spirit. She's 14 years old and was having a little trouble navigating the floors. She loves having the socks on and with the skid proof bottoms she gets around much better. This is a great site. I'm thinking about doggles for my maltese for when we go bike riding.